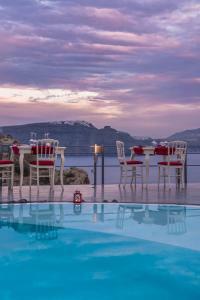 The Andronis Boutique Hotel is located in the quiet town of Oia, 4 km from the beach of Paradisos. It offers spectacular views of the Caldera, a spa, a swimming pool, an organic restaurant and personalized services. Please inform Andronis Boutique Hotel in advance of your expected arrival time. For this, you can use the special requests section when making the reservation or contact the accommodation directly. The contact details appear on the booking confirmation. Open-plan suite with a private balcony overlooking the caldera, an indoor or outdoor hot tub, a seating area, and a cave-style bathroom with marble floors. This simple suite features a spacious terrace with a hot tub and spectacular views of the sea and the volcano, luxury beds, a cave-style bathroom with hydromassage shower, free Wi-Fi, bathrobes, slippers and a minibar with organic snacks. Elegantly decorated suite with whitewashed walls and a terrace with views of the Aegean Sea and the volcano, a private plunge pool and hydromassage shower. It also has air conditioning, a minibar, a spacious separate lounge with flat-screen satellite TV and free Wi-Fi. This room is tastefully decorated and has a balcony overlooking the Aegean Sea. It has free Wi-Fi, air conditioning, a shower with hydromassage jets, a minibar and a seating area with a flat-screen satellite TV. Elegantly decorated suite with a balcony overlooking the Aegean Sea. It has free Wi-Fi, air conditioning, a private infinity pool, a shower with hydromassage jets, a minibar and a spacious and independent living room with a flat-screen satellite TV. The Luna de Miel suite, which has a private infinity pool with panoramic views of the volcano, is air-conditioned and soundproofed. It includes a spacious living room with a characteristic design and built-in sofas. There is a flat-screen cable TV. This elegantly decorated suite offers a private pool and views of the caldera. Features a furnished balcony, seating area and flat-screen TV. This 70 m² executive suite has a terrace and a secluded and deep cave-style pool with hydromassage and views of the Aegean Sea and the volcano. It presents a typical architecture of Santorini that combines with contemporary elements, an exquisite environment, whitewashed walls, elegant lines and designs of colors according to the Aegean Sea.